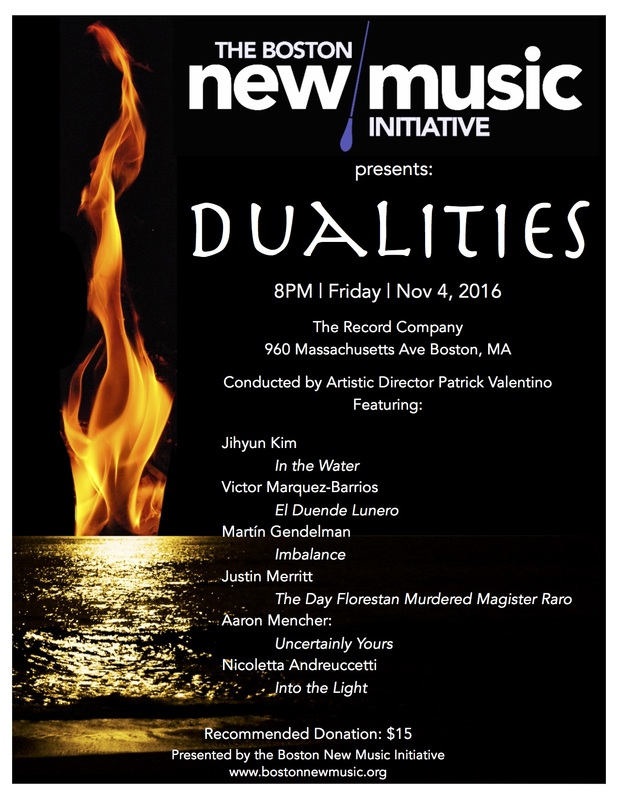 THIS PROGRAM IS SUPPORTED IN PART BY A GRANT FROM THE BOSTON CULTURAL COUNCIL, A LOCAL AGENCY WHICH IS FUNDED BY THE MASSACHUSETTS CULTURAL COUNCIL, ADMINISTRATED BY THE MAYOR'S OFFICE OF ARTS AND CULTURE. Aaron Mencher is a composer who has written “refreshingly different” (Jeff Jordan) contemporary classical music, film scores, and incidental music. His music has been performed by ensembles such Deviant Septet, the Atlantic Music Festival Contemporary Music Ensemble, members of the Edmonton Symphony, the All-National Concert Band, the Ars Futura Ensemble and the University of Missouri Wind Ensemble. He has received recognition from Boston New Music Initiative, NAfME, the Third Millennium Ensemble, the American Prize, and the Sinquefield Charitable Foundation. He currently studies composition with Dr. Phillip Sink, and previous teachers include Dr. Stefan Freund, Dr. Tom McKenney, and Dr. William Lackey. Nicoletta Andreuccetti composes acoustic and electronic contemporary works. She has enriched her musical training developing a variety of interests ranging from musicology to aesthetic and psychology of music. After the awards in several international competitions (I prize at the International Electroacoustic Music Competition Musica Nova in Prague, I prize at Dutch Harp Composition Contest Utrecht etc.) her music has been performed in the most significant international festivals: Achantes 2009 (Metz, Paris), ISCM World New Music Days 2011 (Music Biennale Zagreb), International Gaudeamus Music Week 2012, Biennale di Venezia 2012, New Horizons Music Festival (USA 2013), Festival Music and Performing Arts (New York University 2013), Orchestra Sinfonica di Lecce 2013, Mixtur 2014 (Barcelona), ICMC World New Music Days 2014 (Athens), Festival Alla battaglia! 2014 in collaborazione con l’RSI (Radio-televisione Svizzera Italiana), Bienal de Fin del Mundo 2015 (Chile), Expo 2015 (Milan), Muslab 2015 (Mexico), I Pomeriggi Musicali 2016 (Milan), INTER/actions 2016 Symposium (Bangor), New York City Electroacoustic Music Festival 2016, 12th International Symposium on Computer Music (CMMR) São Paulo, Maratona Contemporanea 2016-Teatro La Fenice (Venice), ICMC World New Music Days 2016 (Utrecht). Composer Justin Merritt was the youngest-ever winner of the ASCAP Foundation/Rudolph Nissim Award. He is also the winner of a host of other awards including the McKnight Fellowship, the Copland Award, the Minnesota Orchestra Composer Institute Prize, and the Polyphonos Prize. He received his Bachelors from Trinity University and his Masters and Doctorate from Indiana University. He studied composition with Samuel Adler, Sven-David Sandstrom, Claude Baker, Timothy Kramer, Don Freund, and electronic and computer music with Jeffrey Hass. He is currently Associate Professor of Composition at St. Olaf College. He resides in Northfield, Minnesota with his wife Faye and their children Cullen Fang Ouxiang and Molly Fang Qinghe. Jihyun Kim was born in Seoul, South Korea in 1988. Studying composition with Prof. Shinuh Lee, she graduated early with a Bachelor of Music as the Valedictorian and then earned a master's degree in composition from Seoul National University. She graduated with a Master of Music from the Indiana University Jacobs School of Music, where she studied with Prof. Don Freund, Prof. Aaron Travers and Prof. PQ Phan. She is currently pursuing a Doctor of Music at Rice University. Her compositions were performed in Korean venues such as the Korean Music Expo, the Daegu International Contemporary Music Festival (DICMF), and the 40th Annual Pann Music Festival. Furthermore, she had a performance at the 2016 ISCM World Music Days 2016 by the Timf Ensemble and her music was also performed in the USA at the RED NOTE New Music Festival Composition Workshop and the Midwest Composers Symposium in 2014. She won the Libby Larsen Prize in the International Alliance for Women in Music (IAWM) 2015 Search for New Music Competition, the Merit Awards in the 1st Lin Yao Ji International Competition for Composition in Hong Kong, and the second prize in the 35th Annual Contemporary Music Society Competition for Composition in Korea. This piece is a reflection on the desire to find a place to call home. When I wrote this piece, I was struggling to decide if home was in my apartment at school or at my parents' house more than 600 miles away. During this time, I imagined that I was writing letters to friends and family debating this topic, but by the end of each letter, I still couldn't make up my mind, and I inevitably signed each letter "Uncertainly Yours." Into the Light is almost entirely built on the high register producing a delicate and impalpable texture, which frays in sudden openings of light, made by rapid and sudden outbursts of the instruments protagonists of continuous accelerations and decelerations around a hypothetical boundary. The central idea of the piece is to outline a slow, gradual slipping into the immobility, an 'other' dimension in which the instruments move smoothly into the light. Florestan and Magister Raro are characters found in Schumann’s piano character pieces. Florestan is the wild, free tune that perhaps needs to be put in its place. Magister Raro, actually Schumann himself, is the wise, controlling voice that made sense of the proceedings. It does seem at times in this work as though the tunes have overtaken the good sense of the composer. Te quick cuts and tiny quotes reflect the quick-cutting, hyperactive attention spans of television, especially cartoons. Listening to the sounds under water is an unique experience. During my senior year in my undergraduate program, I had an extraordinary experience of being able to concentrate to sounds emanating under water through scuba diving. The sounds I heard as I dived into the water, sounds ringing from the deepest part of the ocean, the soft sounds of the bubbles. I combined all these elements to create a tone material, upon which I built my own music. Although the tone material I created may not exactly match with the sounds of the water, I am confident that my own tone material and music will evoke within the audiences’ mind the various images of the water. Composed following the same instrumentation as Arnold Schoenberg’s Pierrot Lunaire, El Duende Lunero is a work in five movements based on poems by Spanish writer Federico García Lorca. The poems describe various aspects surrounding the world of Gypsies, especially their close relationship with the moon. Three of the poems are recited in pre-recorded preludes to movements I, III and V. The history of the Gypsies living in the region of Andalusia in southern Spain, according to García Lorca, is full of legends and mystery, full of episodes of terror and magic alike. In these legends the moon is permanently present, sometimes as a passive witness, but sometimes more like a Gypsy, assuming a leading role. For Gypsies, the moon can sometimes be a messenger from beyond, an angel announcing a birth or the arrival of death. It can also be playful and fun, always willing to party, sing and dance flamenco; or it can assume the role of a mother singing a song with tenderness to the abandoned Gypsy child. In any event, Lorca’s moon is always driven by a passionate Gypsy heart. Along with the moon, the other character in this work is the duende, a sort of entity that is also surrounded by mystery, making it difficult to describe. The duende is present at different times during the life (and death) of Gypsies. According to García Lorca, it’s in the arts where its participation is vital. Imbalance was originally written for the Tel Aviv-based Meitar Ensemble and premiered in Israel in August of 2015. The title of the piece was initially motivated by the ever-going political and religious tensions involving that country and across the Middle East. The work attempts to suggest points of stability (or balance) in regards to rhythmic regularity, pitch range, and timbre and shows the difficulty of maintaining such stability throughout the piece.